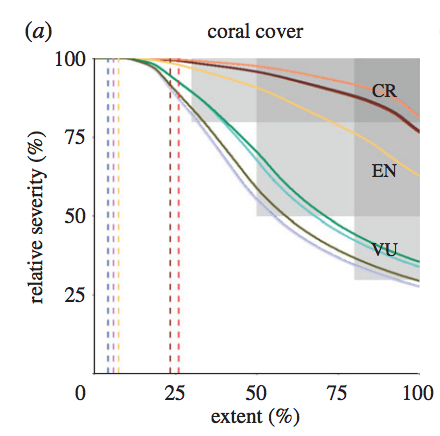 Brief summary of the paper: Effective ecosystem risk assessment relies on a conceptual understanding of ecosystem dynamics and the synthesis of multiple lines of evidence. Risk assessment protocols and ecosystem models integrate limited observational data with threat scenarios, making them valuable tools for monitoring ecosystem status and diagnosing key mechanisms of decline to be addressed by management. We applied the IUCN Red List of Ecosystems criteria to quantify the risk of collapse of the Meso-American Reef, a unique ecosystem containing the second longest barrier reef in the world. We collated a wide array of empirical data (field and remotely sensed), and used a stochastic ecosystem model to backcast past ecosystem dynamics, as well as forecast future ecosystem dynamics under 11 scenarios of threat. The ecosystem is at high risk from mass bleaching in the coming decades, with compounding effects of ocean acidification, hurricanes, pollution and fishing. The overall status of the ecosystem is Critically Endangered (plausibly Vulnerable to Critically Endangered), with notable differences among Red List criteria and data types in detecting the most severe symptoms of risk. Our case study provides a template for assessing risks to coral reefs and for further application of ecosystem models in risk assessment.